I've been taking my pictures, just haven't had the chance to blog them. And I've made it too far to quit now. 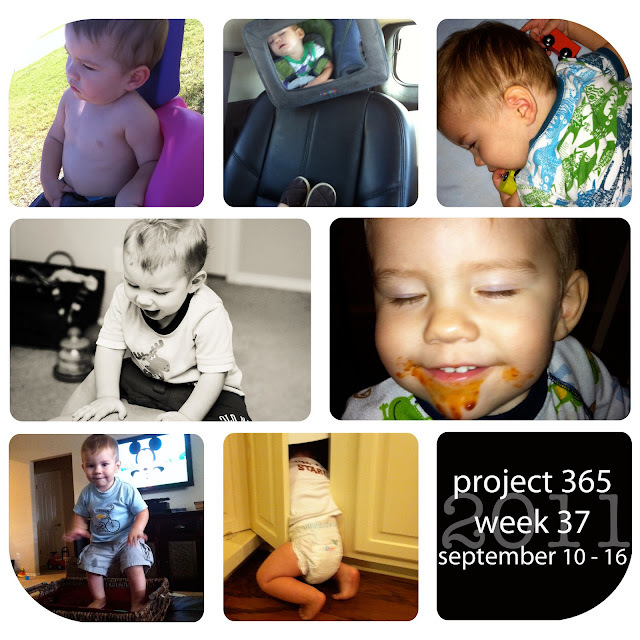 :) Here are the last 3 weeks of project 365! August 28 - And what do we have here? Ah yes, more belly button action while watching Praise Baby. August 29 - I mailed my hair to Locks of Love on this day. I had so much hair she had to cut it in 5 ponytails! It was weird to see it in a bag like that. August 30 - Manny loves Sonic lemon water almost as much as I do. I caught him hiding behind a chair drinking it...he's so funny. August 31 - This was the first day in our rent house! We were trying to unpack, and well...Manny wasn't all that much help. All he wanted to do was climb in the cabinets and take out everything we'd just unpacked. September 1 - We went to SAM'S to get some groceries, and Manny entertained himself by balancing his snack cup on his head. He thought it was hilarious. 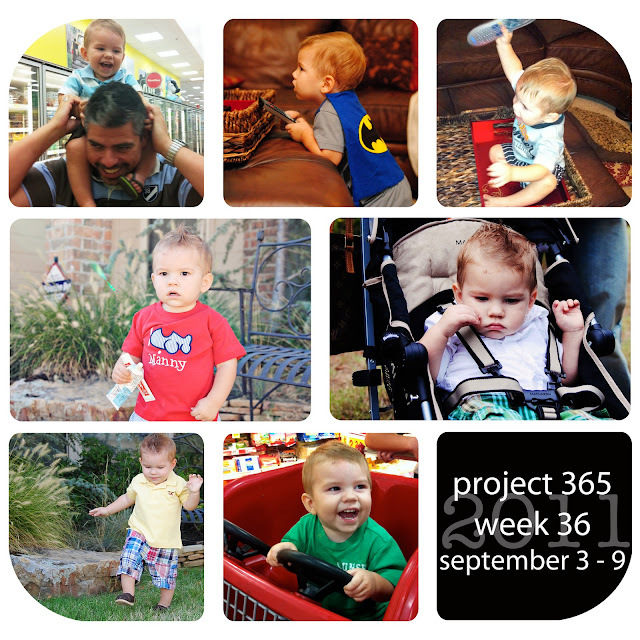 September 2 - We went to Target to grab a few necessities, and he loved riding in the cart. He's ridden in this kind before, but not often since we didn't have this kind at the Target by where we used to live. I'm glad the Target near us has these - so much easier to shop with him when he's riding in it! September 3 - We went to Target (again) and Manny loved getting a shoulder ride from daddy. Pretty sure he squealed non-stop! September 4 - Manny loves to try to turn the TV on when he wants to watch something. Our remotes are so complicated I'm lucky to figure out how to get the TV on, so luckily this isn't something he's mastered yet. It's cute to watch him try though. September 5 - As I just mentioned, he gets fixated with the remotes. He has started building stacks of stuff so he can climb up on the ottoman, and SIT in the tray where the remotes are. It's like his new favorite seat. September 6 - This was Manny'../../2011/09/mannys-1st-day-of-mdo.html">first day of Mother's Day Out. Already seems like so long ago! 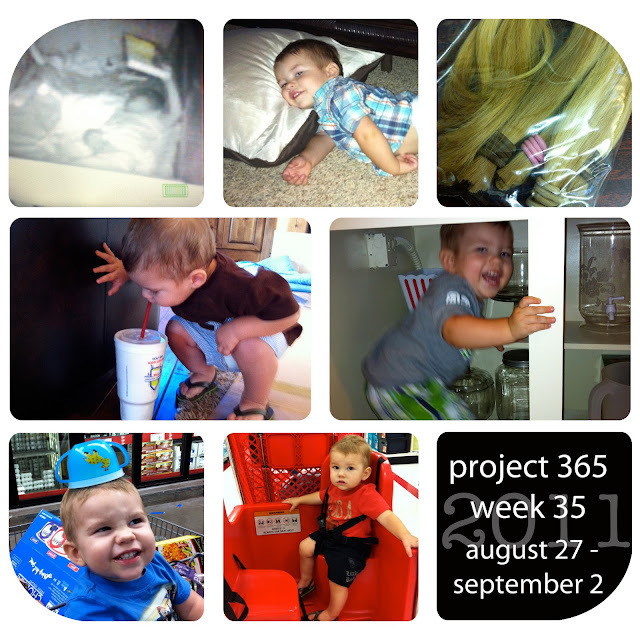 September 8 - I tried to take some pictures of Manny before MDO, but he kept running off. He is impossible to photograph!! September 12 - Manny has really started playing with cars a lot more. When it was naptime, he did not want to put his cars down, so I just let him take them with him to his crib. He was so cute when I laid him down - he was smiling ear to ear like he was proud to have his cars with him. September 14 - I was eating a BBQ hot pocket (random, I know) and set my plate down for a second to go do something. I came back in the room, and Manny had helped himself to it. He loved it! September 15 - Remember how I said he likes to get on the ottoman and sit in the trays? Well he always dances to the hot dog song at the end of Mickey Mouse Clubhouse. So here he is STANDING on the trays dancing. This kid is a mess. September 16 - Our rent house has a lazy susan corner cabinet, and Manny is absolutely fascinated with it. He gets stuck there at least once a day. Wow! That is a lot of hair!! As usual, adorable pictures! Sarah, he is getting so big!! I can't believe it! I love the cup on his head. He takes such wonderful pictures. You are like me, SOOOOOO behind on posting;) I HATE those Target carts. Ever since I starting letting Cilla ride in them she throws a fit to get one at every store and I totally loath pushing them through the store! love the cute pictures! Looks like lots of fun especially the picture of the cup on his head! Looks like a fun few weeks! Looks like I am (fingers crossed) getting ready to move with a 15-month old next month--let me know if you have any tips or lessons learned along the way. :) I've started packing during nap time, but I fear that can't last forever! Wow, that is alot of hair :D How are y'all liking the rental house?